Are you interested in volunteering in a meaningful way, to make an impact on someone’s journey towards stability? If so, StepUp has just the opportunity for you! StepUp Ministry is looking for Co-Partners for our Life Skills Program, where participants learn skills like budgeting and goal setting. Our goal is stability in all aspects of life over the long term. Not sure if you’re ready to commit? Come see Life Skills in action on a Tuesday night. The cliché “It Takes a Village” was recently more than a trendy phrase for StepUp Ministry. It was truly lived out when our Men’s Clothing Closet, GG's Closet, needed a new home. Many thanks to the volunteer work of First National Bank, Relias, Inc., members of Westminster Presbyterian, and GG’s Closet Founders, Carolyn Johnson, and Ann Hanley. The move involved clearing out old furniture, cleaning, painting, packing, and moving many racks of clothing, shoes, furniture, etc. Also, StepUp would like to thank Westminster Presbyterian for providing the space, Sherman Williams on Peace Street for donating supplies, and Linda Craft Realty for usage of their moving truck. Again, many thanks to everyone coming together to help! First National Bank employees pictured above help paint StepUp Ministry’s new GG’s Closet space on January 24, 2019. This clothing closet allows job seekers to get interview clothing. At StepUp Ministry, we enjoy working with a broad group of corporate, government and individual partners who help support and enable us to provide guidance and new opportunities for those looking to change and improve their life. Taking the initiative to transform one’s life is no small task and usually filled with many obstacles and challenges. Ensuring we have the right people and resources in place greatly helps our participants, giving them the courage and determination to move forward and succeed. First National Bank employees pictured above help bring in donated presents to StepUp’s Christmas party held on December 20, 2018, at our Alumni Program. We have a lot more work ahead of us, but it is important that we celebrate all we have accomplished and thank members of the Raleigh community who have generously supported our mission. StepUp’s 30th Anniversary Gala event on January 26, 2019, will be a special time for everyone to come together, exchange stories and learn about the courage it takes to reach your goals and build a better life. The presenting sponsor for the gala, First National Bank (FNB), shares our mission of providing new, life altering opportunities for adults, children and teenagers living in Wake County. FNB has maintained a commitment to improving the quality of life in the communities it serves since 1864. Built on a culture of giving back, employees remain active in their local communities through volunteerism, board service and fundraisers. FNB also gives back through financial support, partnering with local organizations throughout their footprint to address the needs of the community and make an impact where it matters most. First National Bank employees pictured above help move into StepUp Ministry’s new GG’s Closet space on January 24, 2019. This clothing closet allows job seekers to get interview clothing. Working with partners such as FNB helps raise greater awareness and visibility around many of the difficult issues people face. It also provides us with another resource channel to aid our participants in their journey to greater stability and career success. FNB offers a wide range of community development programs designed to strengthen local communities, including Home Ownership and Home Rehabilitation Programs, financial education workshops, Educational Improvement Tax Credits and more. Partnering with others to change lives is critical to our success and we appreciate what organizations like First National Bank have done to help us make a difference and continue making a difference. More information about StepUp Ministry’s 30th Anniversary including ticket details can be found at www.stepupministry.org/30th. “I can honestly say volunteering in the nursery at StepUp is one of the most rewarding things I do with my time. I was aimlessly looking at different volunteer opportunities for a while before I found my perfect match at StepUp. The staff, participants, and their kids are all amazing. Being a part of peoples’ lives while they go through such profound change and growth is incredible. You should join the nursery volunteers if (1) you have a passion for positively impacting people’s lives, or (2) you like fostering a fun, nurturing, educational, and lighthearted environment for little ones. An added bonus is you will never leave that place without a smile. I could be having the hardest day at work but it goes away with the kids’ laughter and fun. Local business owner, Reggie Winston visited our Life Skills program and donated 10 gift certificates for individuals to receive complimentary services at the Bar Ber Shop located at 4551 New Bern Avenue. 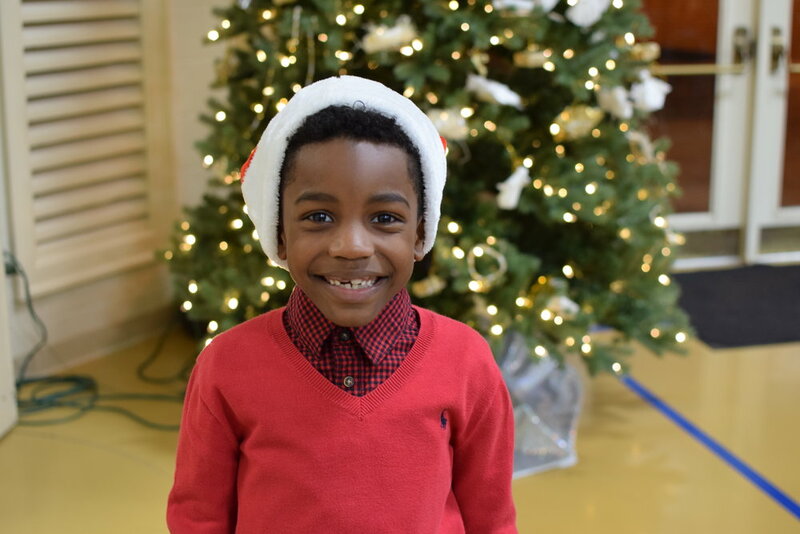 Reggie stated that “he loves the program and wanted to be a blessing to StepUp.” We love our volunteers and donors! We could not do the job that we do without community support! Thank you, Erica and Reggie for stepping up in service. Other age-appropriate ways to provide structured time for the children. The minimum age for this role is 16-years-old if you are volunteering with a parent, or 18-years-old without a parent. Volunteers are needed Tuesday nights from 5:45 to 8:30 at White Memorial Presbyterian Church. If you are interested, please contact Cynthia Walker, Volunteer Recruiter, at 919-781-0156 ext. 111 or cwalker@stepupministry.org. Bill Wenner has been volunteering for 20 years. A year ago, his company, Wells Fargo, moved Bill to Raleigh to oversee their auto division. In the single year that Bill has lived in Raleigh, he has spent 120 hours volunteering at 10 non-profit organizations in the Triangle. StepUp has long received generous support from Wells Fargo. This year, Bill sat on the Wells Fargo committee that reviewed StepUp’s grant application. Bill was intrigued with StepUp’s work and reached out to see how he could get involved. Today, Bill is a co-partner in StepUp’s Life Skills program. In this role, Bill works one on one with a mentee and helps him budget, set goals, and plan for the future. Additionally, Bill will be supporting the We Step Up campaign beginning in September 2018. In his leadership role, he also encourages his 500 employees to get out and volunteer! His team alone has volunteered over 1,000 hours since opening in Raleigh in April 2017. Interested in joining Bill as a StepUp volunteer? We need you! Email volunteer@stepupministry.org to learn more. Want to help transform a life? Are you interested in volunteering in a meaningful way, making an impact on someone’s journey? If so, we have just the opportunity for you! We are in need of 15 co-partners, who will walk alongside our Life Skills participants as an extra arm of support in their StepUp journey. The goal is stability in all aspects of life over the long term. 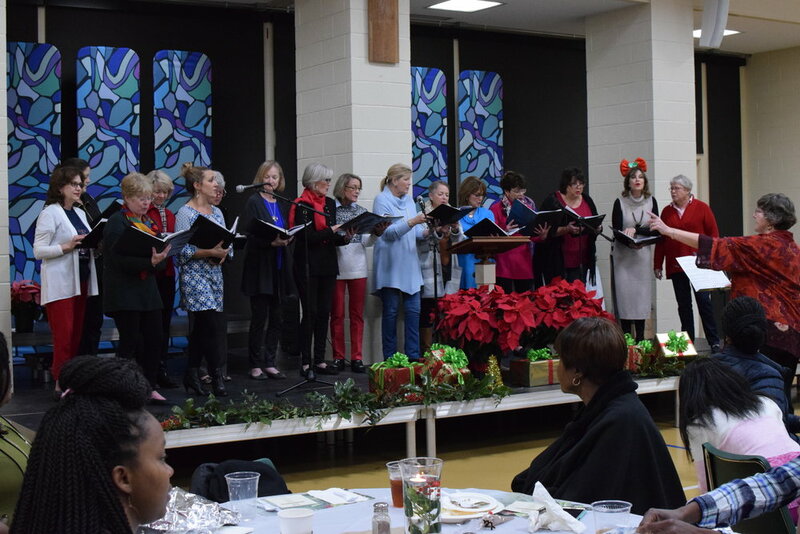 Each adult is partnered with a staff case manager and a volunteer from the community, who we call a “co-partner.” Co-partnering is a nine-month commitment every Tuesday (at White Memorial Presbyterian Church) or Wednesday (Christ Episcopal Church) night from 6-8:15pm. Commitment involves meeting once each week to work with an individual as they go through the Life Skills program. Our next group of co-partners will start in June so if you are interested, we will get you signed up for a one-on-one training session with our staff so that you feel fully prepared for your new role. Contact us at volunteer@stepupministry.org or (919) 781-0156 if you are interested in signing up, touring our Life Skills program, or just want more information! StepUp hosted a party at Cantina 18 on Monday, April 16th to show our appreciation for all the hours of work the volunteers give to the ministry. The StepUp staff presented individuals with Volunteer of the Year awards for each department. Congratulations to the award winners, and thank you to all of the 300+ volunteers who allow StepUp to do the work we do each day. We are truly grateful for each one of you. This July, we welcomed six new members to our board of directors. These six individuals come to us with experience in business, leadership, service, etc. They are passionate about our mission, and we are excited to have these incredible people on our team. The StepUp Ministry Board of Directors represents the diversity of faith congregations, financial resources, expertise, community partnerships, and volunteers it will take to strengthen StepUp in the coming years. Co-Partners: We are short 10 co-partners for the next phase. Will you fill that role? 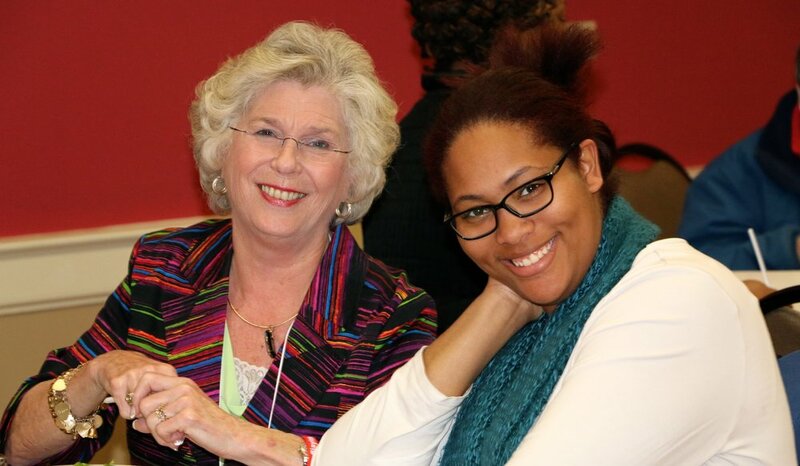 Serve as a one-on-one mentor weekly in our Life Skills Program for adults or young adults. Summer Meals: Prepare meals for the summer, a great opportunity for a group to serve! Children’s Program: Read to, play with, and encourage children ages 6 weeks-16. For more information, please contact Laura Martin at (919) 781-0156 ext. 126 or lmartin@stepupministry.org. This week is National Volunteer Week, and we are so thankful for all the volunteers that make our work at StepUp possible. Are you looking for a way to get involved in StepUp? We have some opportunities coming up, and we would love for you to join us! Impact Luncheon: Our annual fundraising luncheon will be held Monday, June 5th, and we will need volunteers to help set up, plate the food, and clean up. We will need volunteers on Sunday, June 4th from 2:30-4:30 p.m. and on Monday, June 5th beginning at 10:30 a.m. If you are interested, please contact Neill Frantz, nfrantz@stepupministry.org or 919-781-0156 ext. 122. 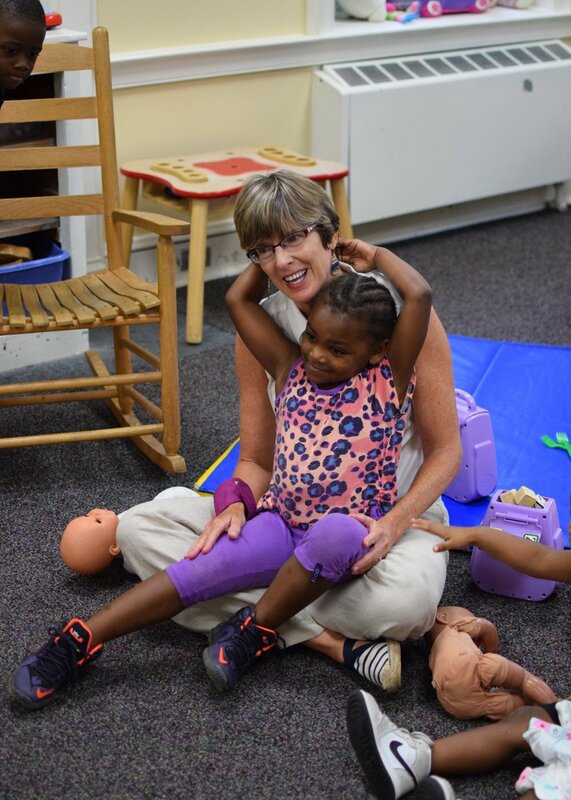 Summer: Many of our regular volunteers are not able to commit to our summer program, so we will need volunteers to help nurture and care for our children, ages 6 weeks-16. If you are interested, please contact Laura Martin, lmartin@stepupministry.org or 919-781-1056 ext. 126. You're invited to buzz on over to StepUp Ministry's Volunteer Appreciation Party! We want to celebrate all of the volunteers who give their time, talents, and gifts to StepUp. Mark your calendar now and join us April 24! There are more than 400 volunteers who serve with StepUp Ministry. We are so grateful for every person who volunteers as a mentor, teacher, coach, friend to our children, and supporter of so many things to make StepUp a place where lives are changed. We want to Celebrate all of the volunteers who give their time, talents, and gifts to StepUp. Mark your calendar now and join us April 24! Interested in helping someone reach goals, encouraging, good listener – volunteer as a Co-Partner! Contact Suzanne Templeton, stempleton@stepupministry.org today to learn where you can use your gifts and talents to serve. 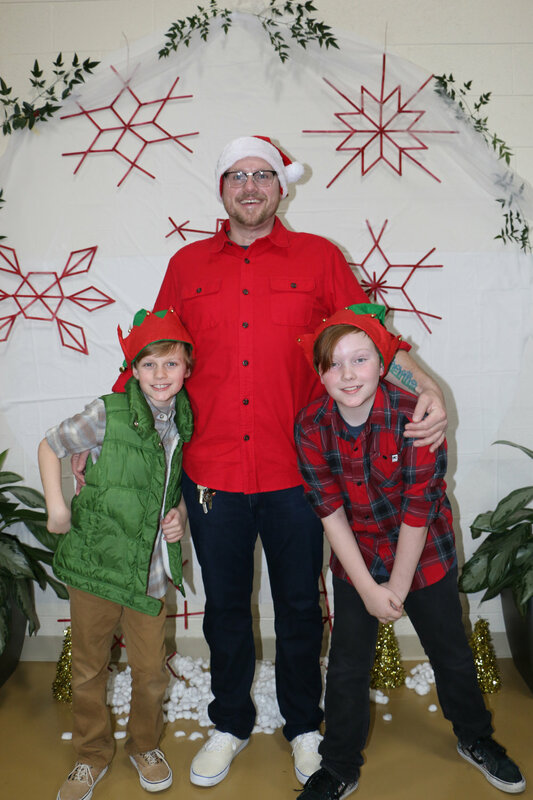 StepUp Life Skills, Alumni, and Employment Week participants, along with staff and 30 volunteers, came together for our annual Christmas party. After sharing a delicious holiday meal, we played a game of Family Feud, heard festive tunes, and took plenty of pictures in the photo booth. Santa stopped by to hear the Christmas wishes of our children, and we got to enjoy some Christmas songs by the Fountain Singers from the Fountain of Raleigh and the Junior League of Raleigh Choir. Thanks to everyone who gave of their time and talents to make this event a success! Church On Morgan’s missional community group chose StepUp as a place they want to invest their time. 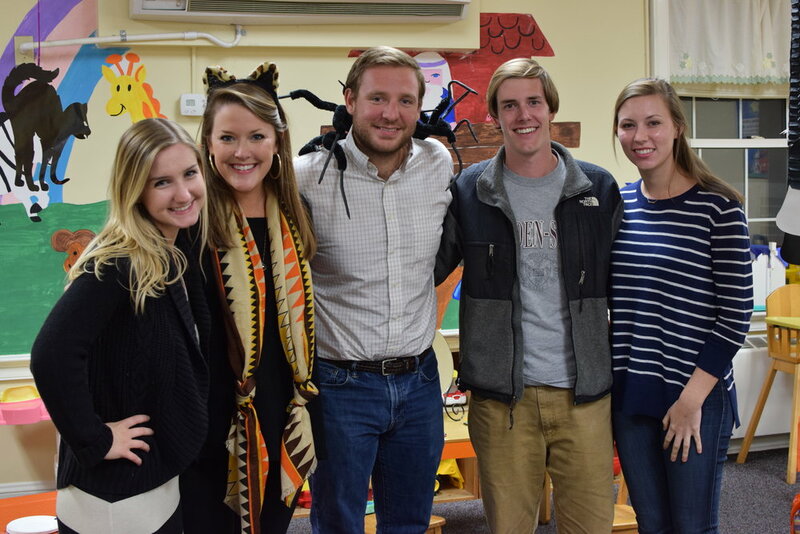 This group volunteered to do our Harvest Fest back in October for our children’s program, and it turned out amazing. The group made green slime, painted pumpkins, read Halloween books, and decorated cookies with the kids. We really appreciate them for doing such a great job with this event, and we know the children had a blast. StepUp Ministry Volunteers Make It Happen! Please look at these awesome volunteer opportunities and sign up today! Work with children age 5-16 on homework, special projects, class time, and other activities included in the Life Skills program. Minimum age for this role is 21. Serve side by side with young adults (16-21) or adults to provide support, accountability and encouragement. Teach on topics including Goal Setting, Financial Education, Relationships & Boundaries, Personal and Career Development. Are you interested in volunteering with the children, young adults or adults in Life Skills? Contact Suzanne Templeton stempleton@stepupministry.org or 919-781-0156, ext. 111 for more details! Volunteers Making a Difference--There's Room for You Too! Currently, more than 65 volunteers make a difference in the lives of our Life Skills participants every week. Volunteers serve as mentors, called co-partners, for adults and children, instructors, office support, meal servers and so much more! We need to fill over 40 additional volunteer openings within the adult and children programs by November 1st. Please join us to serve as a co-partner, children’s program volunteer or provide motivation to eager job seekers in our Employment Week. Please contact Suzanne Templeton, volunteer coordinator at stempleton@stepupministry.org to volunteer today!